Think you've got a case for the Judge - call the toll free number: 1-888-V-E-R-D-I-C-T. Be prepared to give a brief description of your case. Also be sure to leave your name and phone number so that one of the show's producers can get back in touch with you. 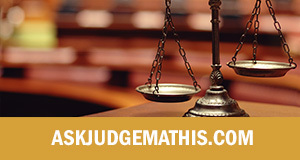 Or you can fill out our online submission form below to send your case to Judge Mathis.